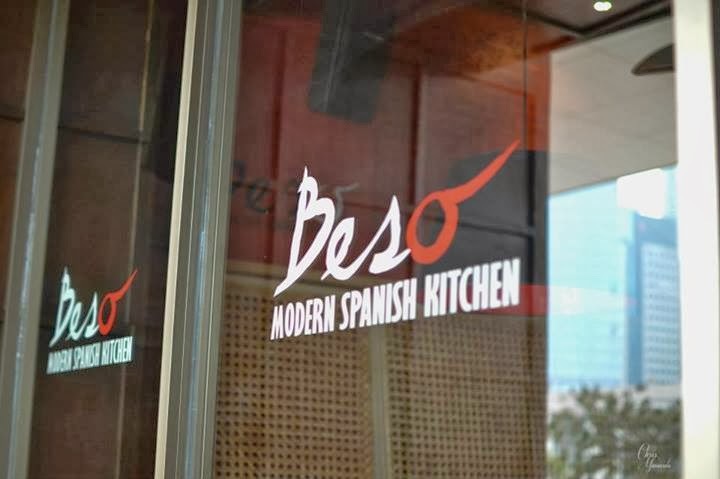 From the interiors to the food, everything speaks of first class at Beso Cucina Vinoteka. We were joined at lunch by Celebrity Chef Carlo Miguel in this event I arranged. 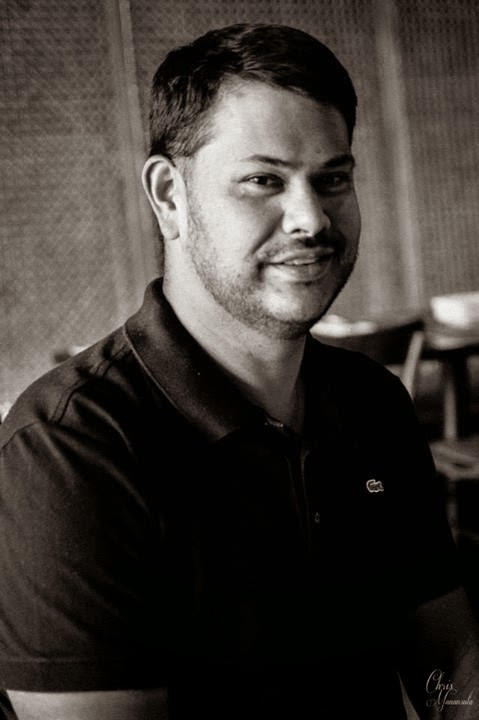 Carlo is also the executive chef in 12 other restaurants including all 4 branches of Draft and Black Olive. It was great to meet this guy as he is so humble despite having 20 years of experience as a chef. I have to give special mention to the service here in Beso Cucina Vinoteka. The servers were always looking to make customers feel comfortable during their stay at the restaurant. When they see a customer getting impatient for his order, they will give him a time frame of the number of minutes left before the dish is served. The kitchen is also open so you can see what is going on in there. Carlo told us he properly trained each chef and he complimented all of them for being so eager to learn. 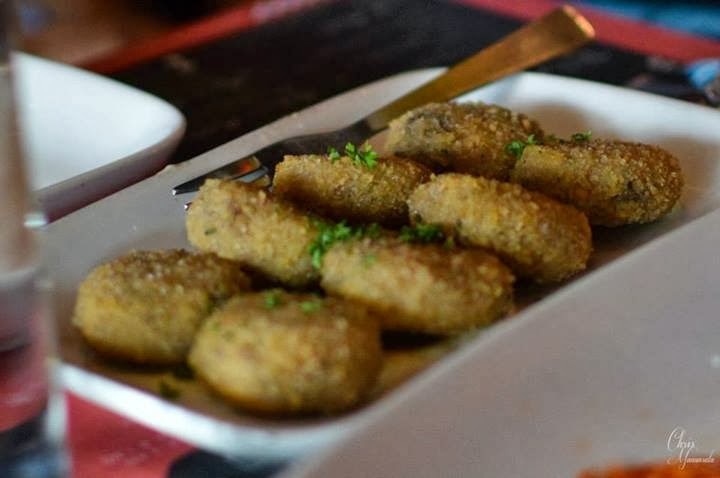 Out came the Tapas (appetizer) and first up was Mushroom Croquetas. Words can't describe how much I loved this appetizer. I am glad they let us taste this as this is one dish I would not mind ordering again and again. It gets very addicting on the first bite as you would want more of it right away. 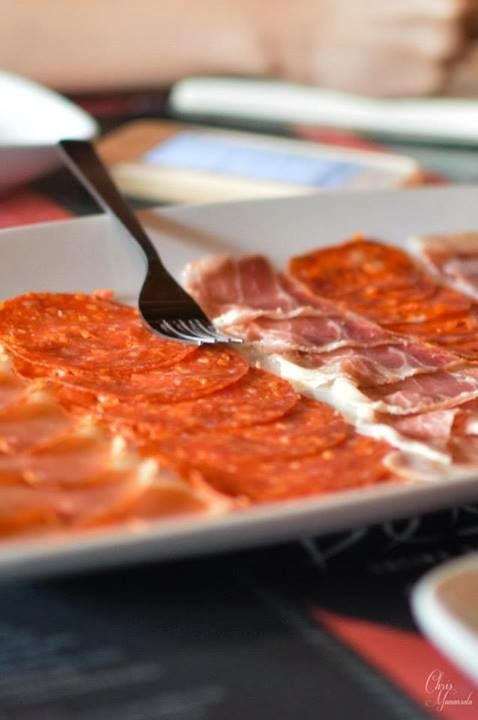 Believe it or not, it was my first time having a bite of cured meats and I loved it. The platter had chorizo pamplona, lomo iberico, chorizo iberico, jamon reserve and jamon serrano. 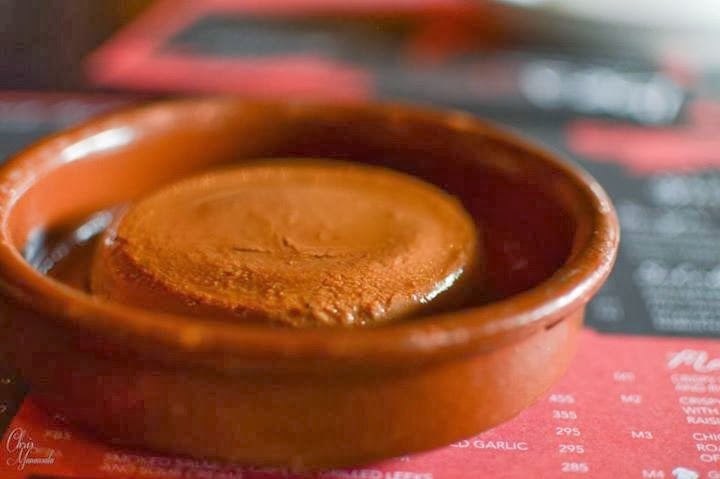 By this time, Chef Carlo Miguel told us that it would be best to use our fingers for the Tapas. I was hesitant at first but I eventually gave in since you had to do that in order to eat the Gambas. I love shrimps and their version is simply irresistible. 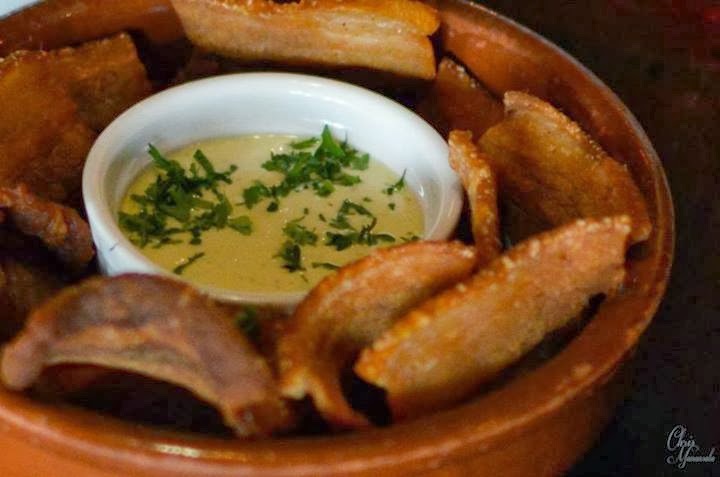 Bagnet lovers will love this dish plus the fact that it has chili lime aioli sauce. It tastes as good as it looks and the crunchy taste will leave you wanting more. 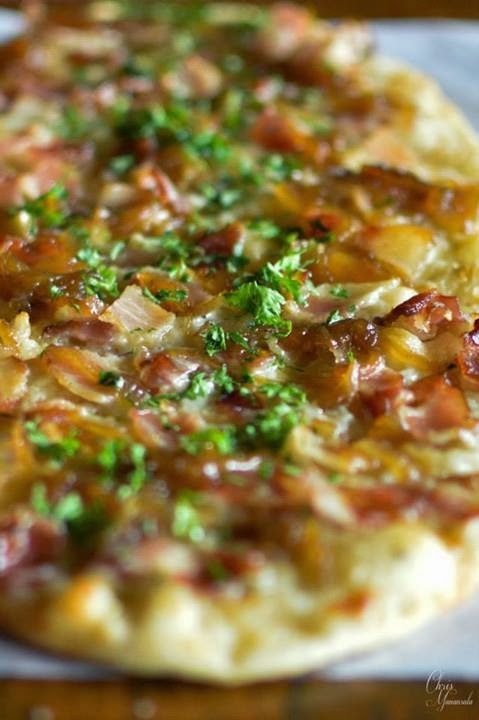 The flat bread is a better version of pizza. I used to be a pizza lover but now I am a flat bread lover as well. The bacon, blue cheese and onion jam flavor is a great combination since I remember another chef saying that anything with bacon is good. I thought these were mini chicken burgers but they are a first class version. 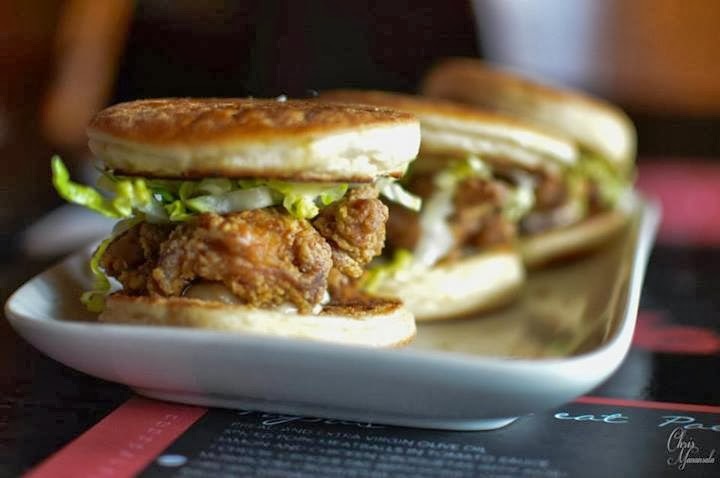 The chicken was fried to perfection and it was sandwiched between two pancake breads along with lettuce as well. 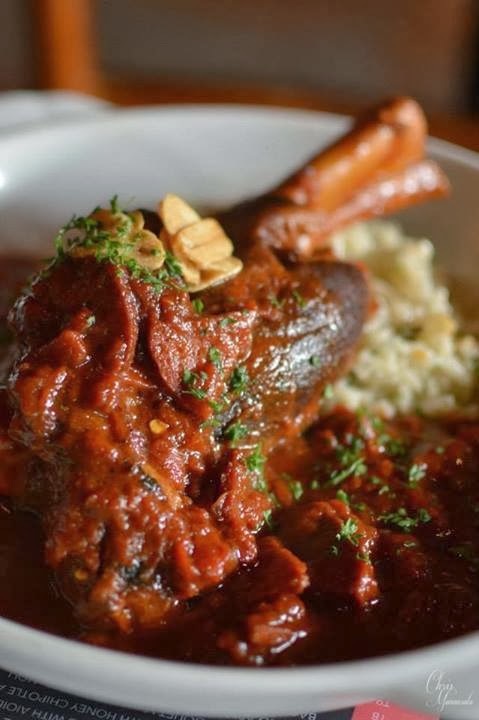 When I got to taste the braised lamb shank, I quickly felt sorry for my vegetarian friends because they don't know what they are missing. Who does not like lamb? This one is a real winner. It may carry a heavy price tag but it is worth every penny. 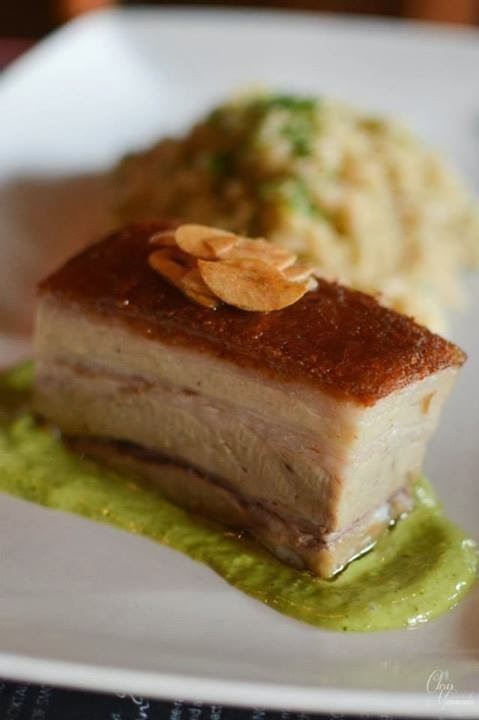 The crispy skin pork belly comes with rice pilaf and mojo verde. My eyes lit up when I got to taste this wonderful dish. I have to admit it did not take long before we got to finish this one because of how delicious it was. The paella is what we came for and we got the Squid Ink paella. I wonder how it would feel to have too much of this and your teeth would be all black. It is their specialty paella and it did not disappoint one bit. 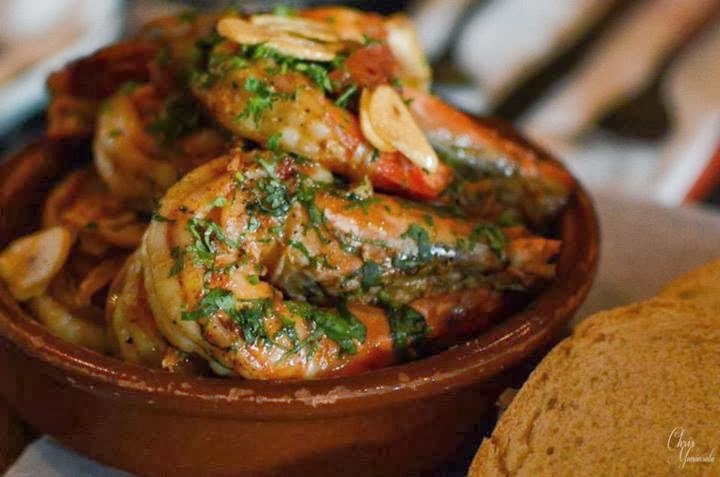 It contains prawns, chorizo, bacon and squid. This is one time when I would not mind being seen with my lips colored black. 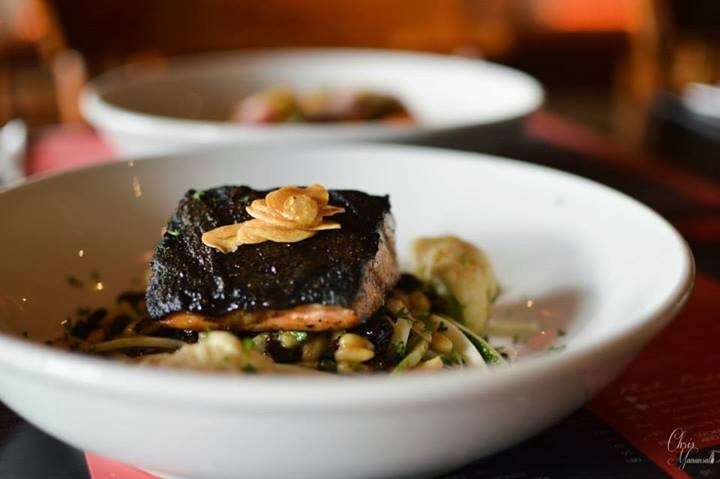 Salmon lovers would love this dish as it is mixed with cauliflower, pine nuts, sauteed raisins and zucchini spaghetti. It is one of those dishes where you won't feel guilty after eating it. This is actually the first time I have seen a chocolate leche flan and I got nothing but good things to say about it. Chocolate lovers will love the fact that it is made out of 70% belgian chocolate. 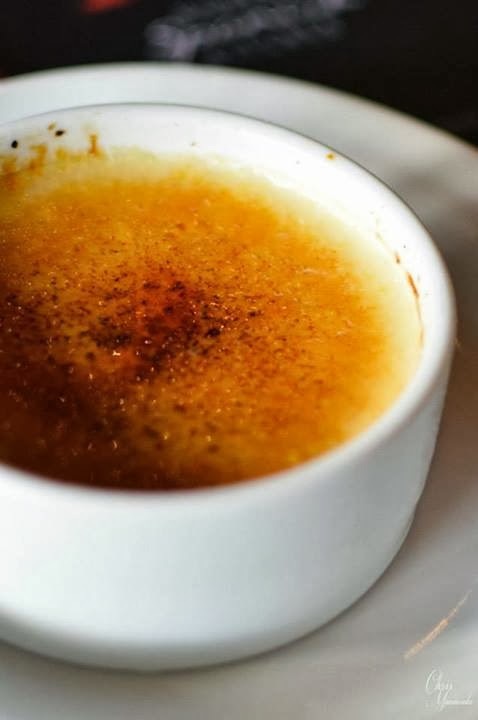 This is Chef Carlo Miguel's version of the Creme Brulee. 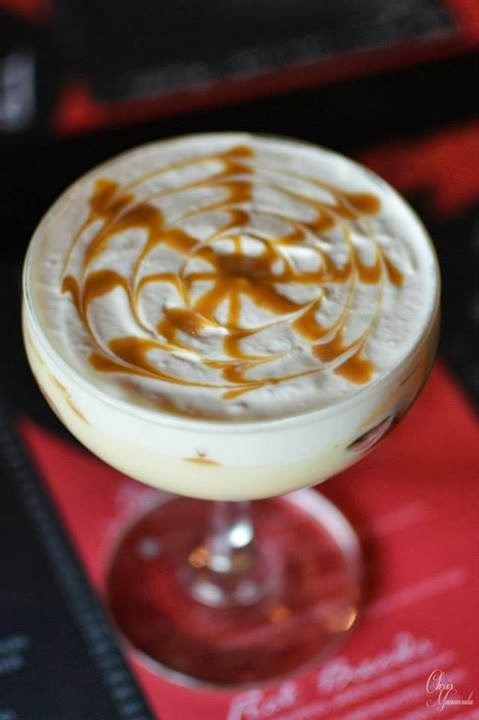 It is rich and creamy as what you would expect and those with the sweet tooth would love it. Out of all the desserts that were served, my favorite was the Dulce de Leche Natillas. I could not stop taking one bite after the other when I got to taste it. 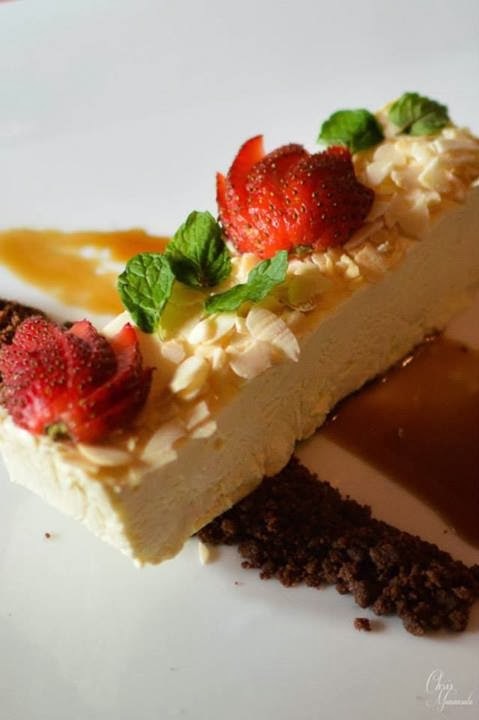 It is actually rich cream on top of Tres Leches cake and it will really make a perfect ending for all the delicious food here at Beso. This amazing dessert comes with chocolate soil, strawberry almonds and mint. Semi Frio actually means half frozen so it is important to eat this one right away instead of waiting for it to melt. The good news is this dessert dish is such a masterpiece that it is something you are going to crave for in the coming days. The bad news is it is only available for the whole month of February. 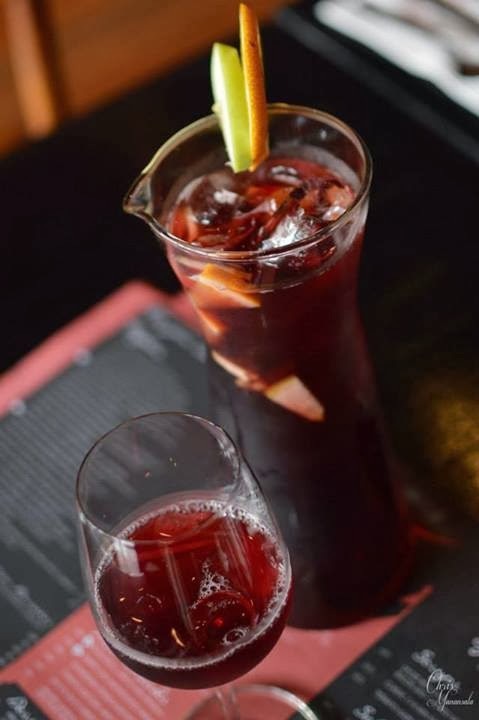 We were actually served with Sangria even if it is lunch time. Everyone wondered why were were drinking early so Chef Carlo told us that it must be past 5 somewhere and I got a good laugh out of that. The Beso Sangria contained cranberry juice and apple juice. It is a drink that is fit for long conversations. 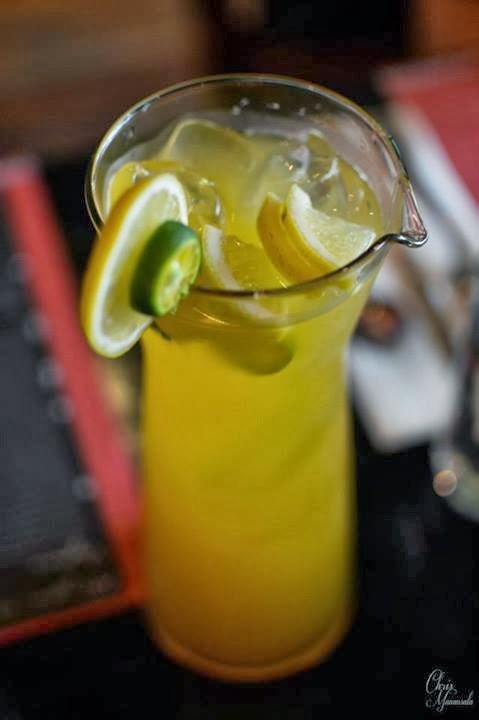 The Calamansi Sangria is rich in vitamin C and it is perfect for those who has the cough and colds. It does not contain much alcohol which is good news for those with low tolerance for alcohol. 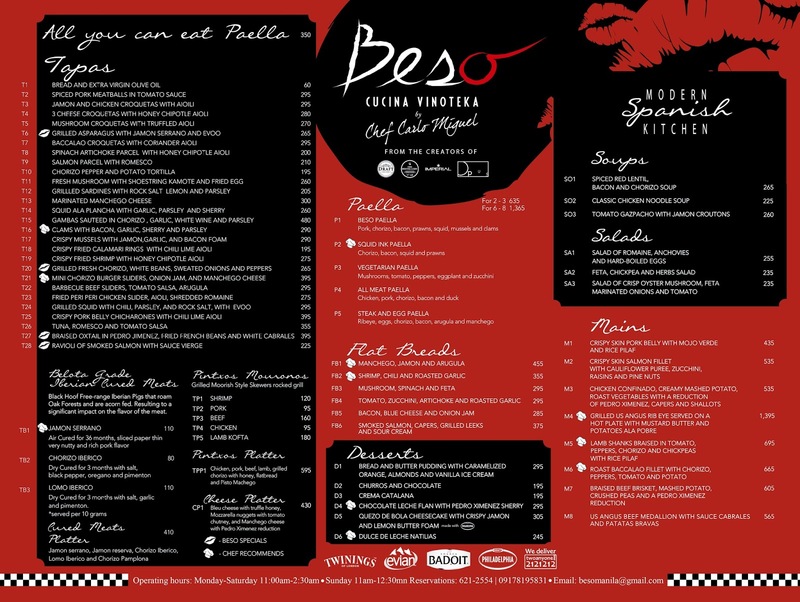 The Beso experience was an unforgettable one. I enjoyed it so much that I chose this restaurant as the venue for my Valentine's date. wow!! i love Chef Carlo and he makes really amazing dishes always well thought of and well conceptualized. The food being displayed here seems so delicious but I think they're too expensive for me. Ohh...love all the food you introduced especially the Braised Lamb Shank. The place seems so good to dine and eat. 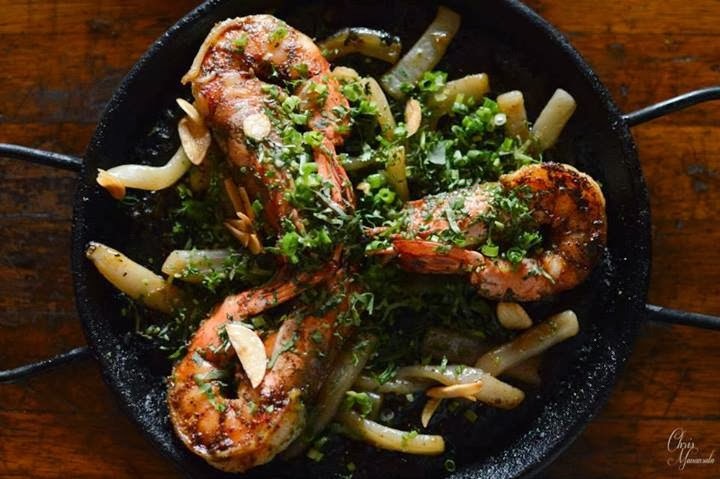 I super love to try gambas. Honestly, I haven't eaten this kind of a dish. That squid ink paella looks very delicious.